The Toyota OEM Engine, Chassis & Body and Repair Manuals are a must for anyone who owns a Toyota Land Cruiser. 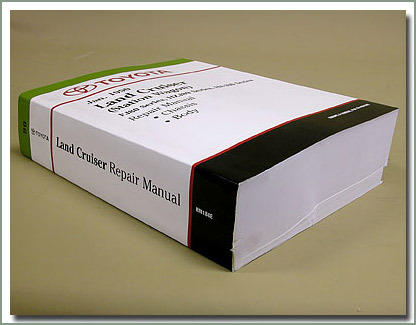 They are outstanding examples of comprehensive repair manuals. Detailed diagnostics, step by step instructions with exploded views of technical drawings, repair hints, torque specs, etc. Not every manual is three inches thick like the one shown here (photos are of #221-64). This is just to show you that you get what you pay for. Earlier repair manuals (prior to 1975) were written in a simpler time, and have not been reprinted in this later type format. However they are still very informative and are considered required reading. Which manual should I order? Throughout the history of the Land Cruiser, Toyota changed the way they produce technical information about the vehicle. Rarely will you find models covered in one book, most are covered in two or three books. Your vehicle will dictate which books you need to complete your library. There is no clear cut way for us to list these manuals by production period so read the description carefully. Specter Off-Road does not accept returns on manuals. If you are in doubt as to which to order, call us, we are happy to help. We also sell supplemental and specialized manuals that detail specific systems. Engine Manuals cover all systems attached internally and externally to the motor. In general they cover production ranges prior to 1988. We list motors by fuel type, Gasoline and Diesel, and on separate tabs. If your engine is not listed here, see the "Repair Manuals" tab. Chassis Manuals cover the entire vehicle except the engine. In some cases they cover all USA and world models, others, USA and World are separate. If you don't see your model here, see the "Repair Manuals" tab. Fits 1975-1980 2F Engine (9/77-1980 should purchase #221-03 manual for igniter & dist info) Reprint - 214 pages. Fits 1985-1987 3F CARBURETED - Non-USA engines - Reprint 206 pages. World - Fits 1986 and Later B, 3B, 11B, 13B and 13BT - World - Reprint 343 pages. USA and Canada - Fits 8/88 and later B, 3B and 11B - USA Canada - Reprint 280 pages. Fits 4/72-8/80 H diesel engine - Reprint 228 pages. Fits 10/85 and later 2H and 12HT engines - World - Reprint 349 pages. Fits 8/80-11/85 2H diesel engines - World - Reprint 260 pages. Fits 8/88 and later 2H and 12HT engines - Reprint 72 pages. Fits 8/84 L, 2L and 2LT diesel engines. Reprint 244 pages. Fits 1/90 LJ70, LJ72, LJ73, LJ77 and LJ79 diesel engines - Reprint 138 pages. Fits 1PZ, 1HZ and 1HDT engines - World - Reprint 356 pages. Fits 1975-1980 FJ40/43/45,55,BJ40/43, and HJ45 Series - USA and World - 1979-1980 also purchase #223-20 power steering manual. Reprint - 510 pages. Fits 1981-8/87 60 Series - USA and World - Includes Air conditioning and wiring diagram - Reprint 52 pages. Fits 10/84-1/90 FJ60/62 USA and all 60/62 and 70 series World - Reprint 744 pages. Fits 10/84-1/90 RJ70 and LJ70 World - Reprint 589 pages. 1988 engine and chassis - USA - For automatic transmission order manual #223-86, for transfercase order manual #221-46, for power steering order manual #223-20C. Reprint - 380 pages. 1991 engine and chassis. 1030 pages total - 2 bound volumes. Reprint. Fits 1991 and later FJ/FZJ80 and HDJ80 - World - 1110 Pages total - 2 bound volumes. Reprint. 1992 FJ80 engine and chassis - 935 Pages total - 2 bound volumes. Reprint. 1993 FZJ80 engine and chassis - USA - 1,264 pages total - 2 bound volumes. Reprint. 1994 FZJ80 engine and chassis - USA Models 1284 pages total - 2 bound volumes. Reprint. 1995 FZJ80 engine and chassis - 1186 pages total - 2 bound volumes. Reprint. 1997 FZJ80 engine and chassis. 1052 pages total - 2 bound volumes. Reprint.